I'm not sure exactly what I should call this item, but technical rendering seems to aptly describe it, so I'll go with that. It was hand-drawn in pencil and it is extremely detailed. It's also fairly large-- it was rendered at a 2:1 scale meaning it twice the size of the production accessory. Such renderings would be created once Kenner had decided on what they wanted a particular item to look like, what features they wanted it to include, etc. Later, their sculptors, pattern makers and vendors would refer to them for guidance as to what the finished product was supposed to look like. 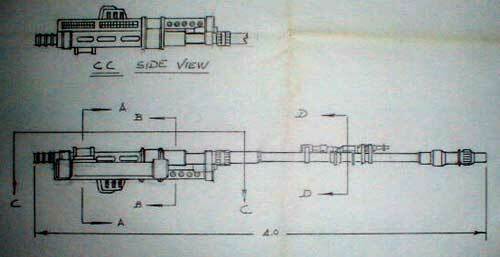 For this reason, every little detail of the toy is included in the drawing you see above, as are its exact dimensions. Here's a close-up of, on the bottom, one full side of the weapon, and, on the top, the opposite side of its wider portion. 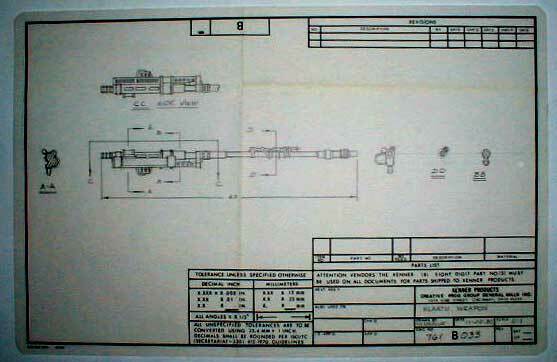 These parts represent slices through certain portions of the weapon. You can tell what portions they represent by referring to the letters drawn on the full-length image of the weapon. Finally, this is the textual area from the lower right corner. It notes the scale and the date of creation, as well as other things.